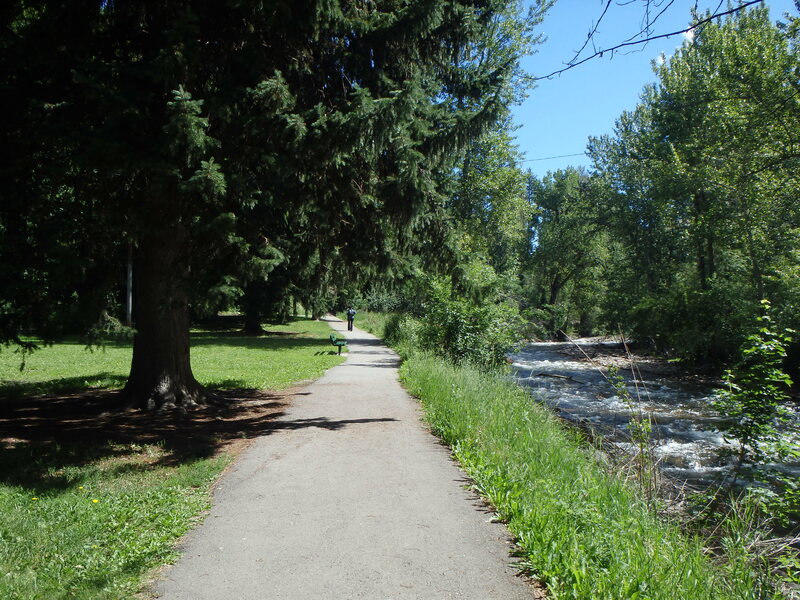 We left Missoula today which was a little bittersweet because we really liked the town and would’ve liked to have stayed longer. 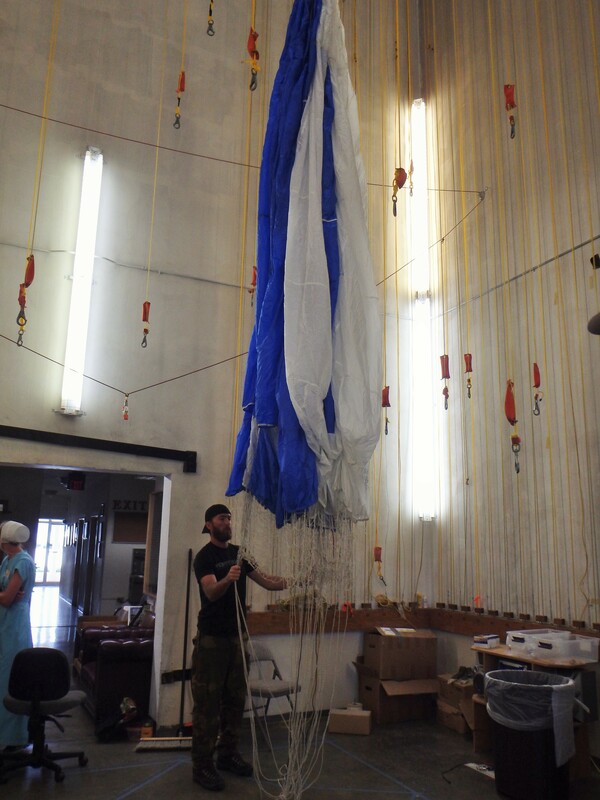 But let me back track a little bit and fill y’all in on what we’ve been up to. 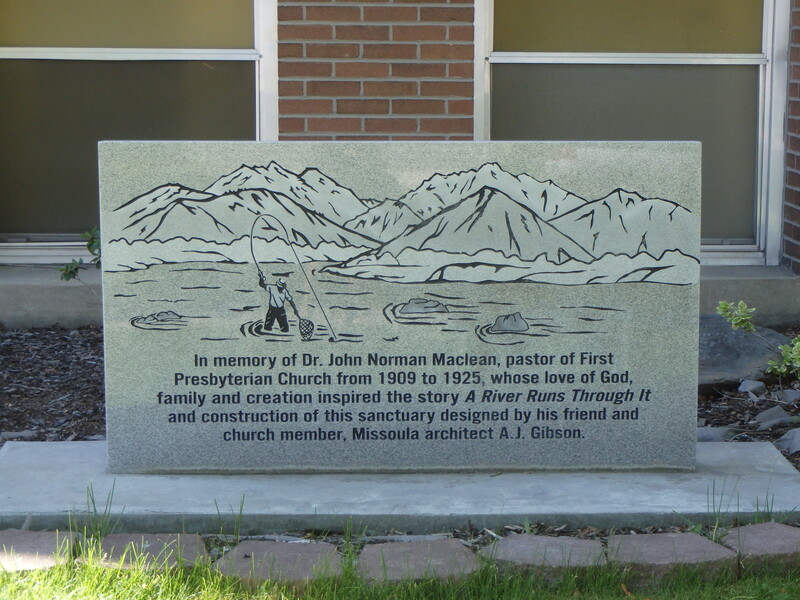 After we finished up our rafting trip and changed into dry clothes we drove into Bozeman for lunch. 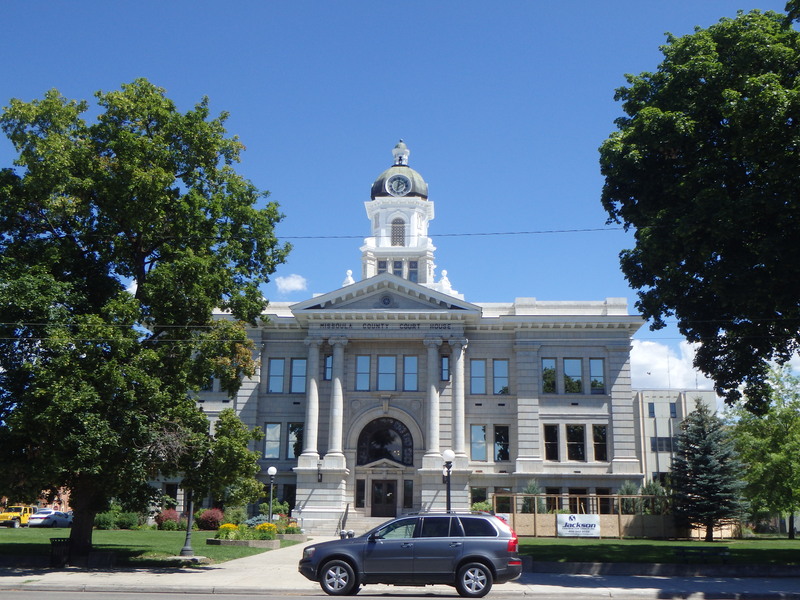 Bozeman has a beautiful downtown strip with nicely preserved buildings and hanging flower baskets that are overflowing. 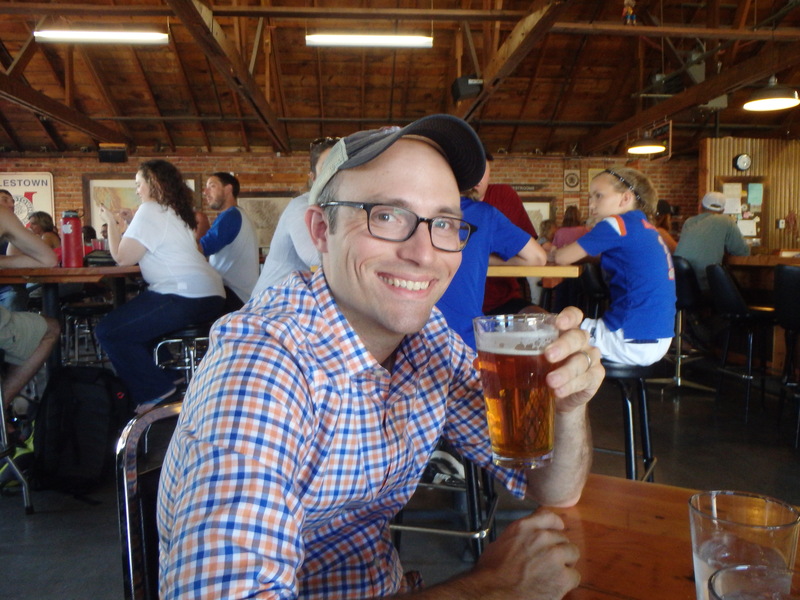 We ate at MacKenzie Pizza Co. – haha – which was really good and our waitress happened to be from Austin. She moved up to Montana a few years ago and really loves it. We tried a couple new craft beers and had a great pizza with pears, blue cheese, and prosciutto. We couldn’t linger too long in Bozeman since it’s a 3 hour drive to Missoula. So after lunch we walked back down main street a bit and then hopped back in the car. The drive to Missoula was beautiful, but I didn’t see much of it because I fell asleep! Poor Zach! He was just as tired as I was but I got to take a nap! 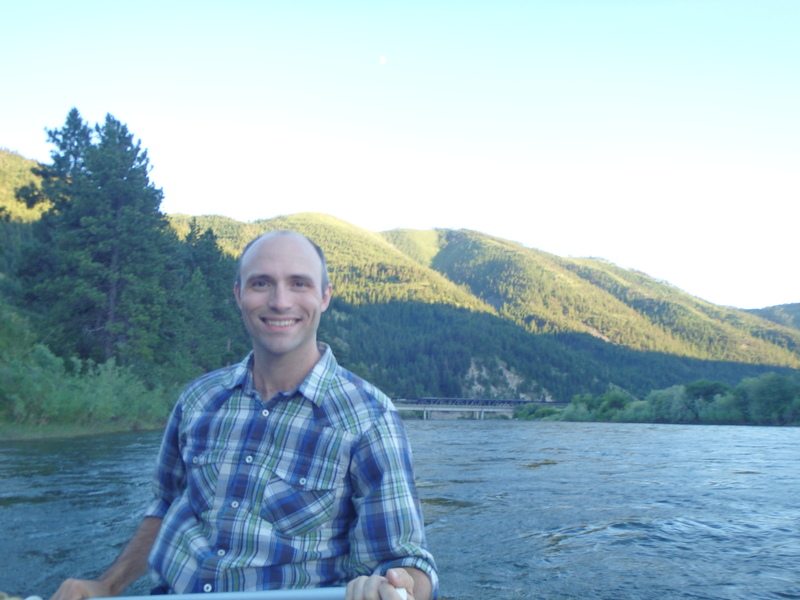 We had couchsurfing hosts in Missoula – Brian and Amanda – so we went to their house first. They were having dinner with their friends and relatives but allowed us to intrude and eat with them so we had a great, healthy meal of spaghetti squash, pasta, sausage, and salad. 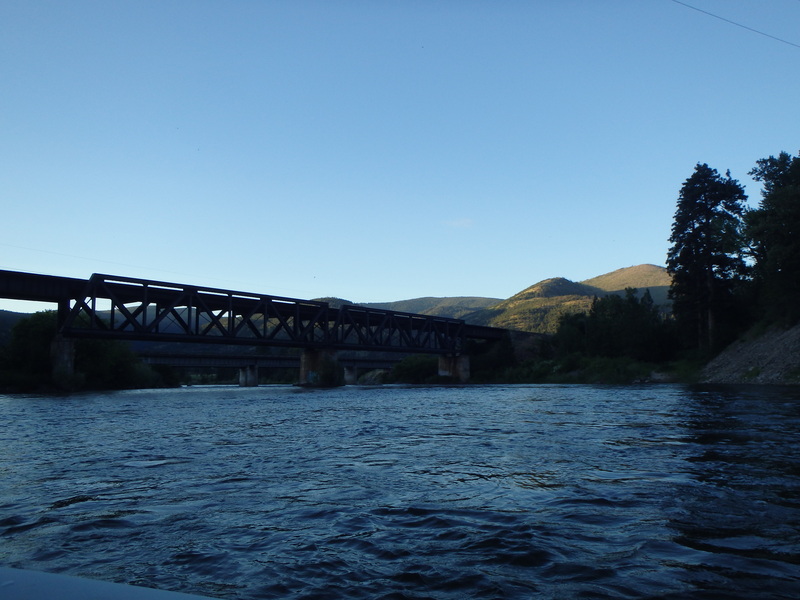 We ate on their porch which overlooks the Clark Fork River. Zach had already found out about a movie in the park that evening so we left after dinner to explore Missoula a little bit and ended up at Liquid Planet, a coffee shop/store for all things liquid (beer, wine, coffee, etc.). We hung out there for a bit binging on the wifi (we’d been starved for a while… national parks…) and then left to go to the movie in the park. The movie was Independence Day (which I had never seen) and it was pretty eventful. 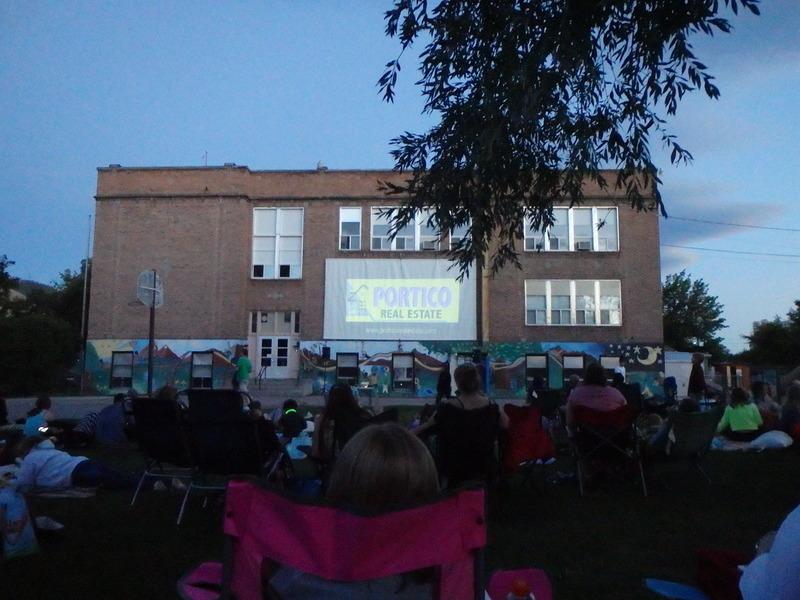 We bought some popcorn for a dollar, set up our chairs, and had a great view of the screen. Then during a couple of the intense moments in the film, fireworks went off in the neighborhood around us – pretty fitting for Independence Day I thought. On Sunday we got up and had breakfast with Amanda, Brian, and their cute kiddos – Indy and Owen. Then we left to do some more exploring. 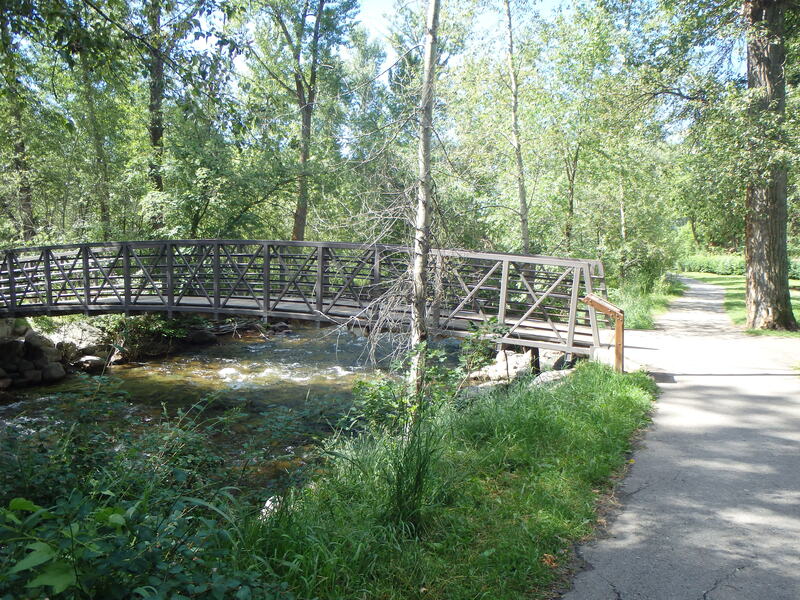 First we stopped at Greenough Park, a 42 acre park that runs alongside Rattlesnake Creek. 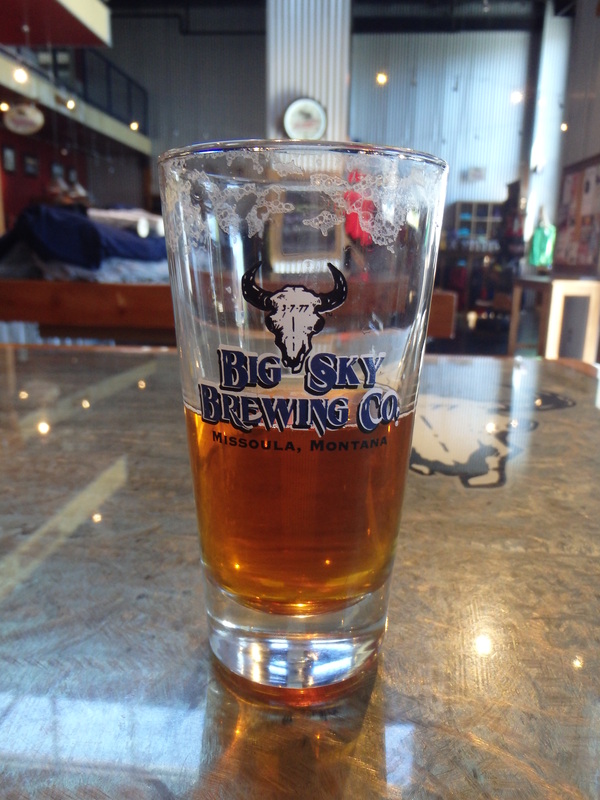 Then we went over to Big Sky Brewing to taste some of the beers we can’t find in Texas. We had 4 free samples each and bought some beer gifts for friends, of course. 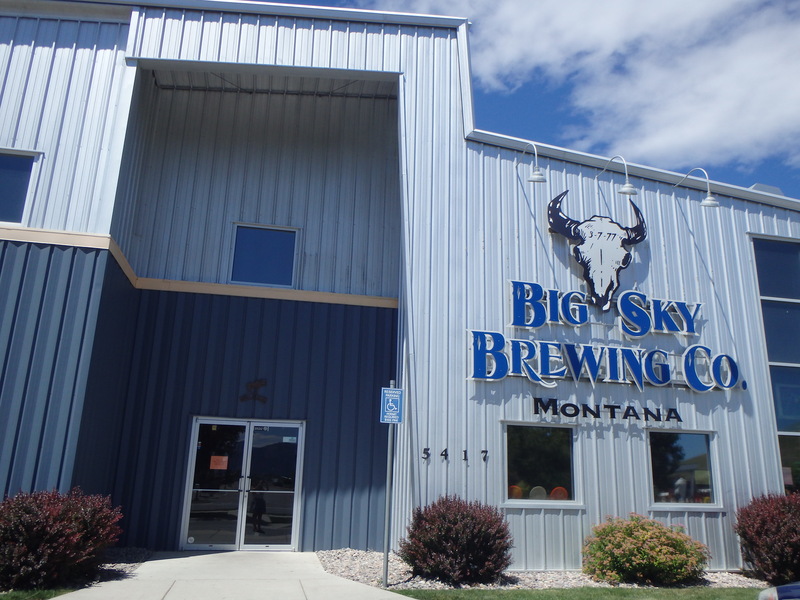 (I love you, Big Sky!) 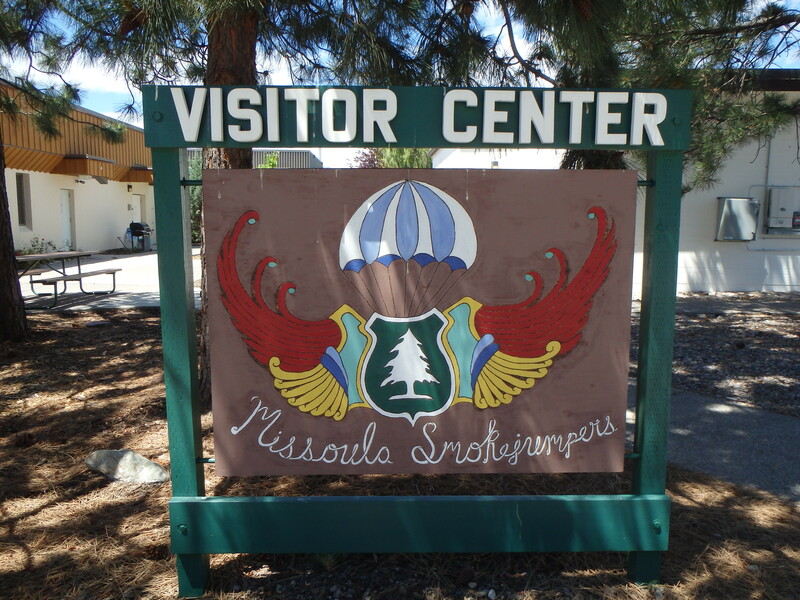 On Amanda’s recommendation we went to the Smokejumper Center after leaving Big Sky. 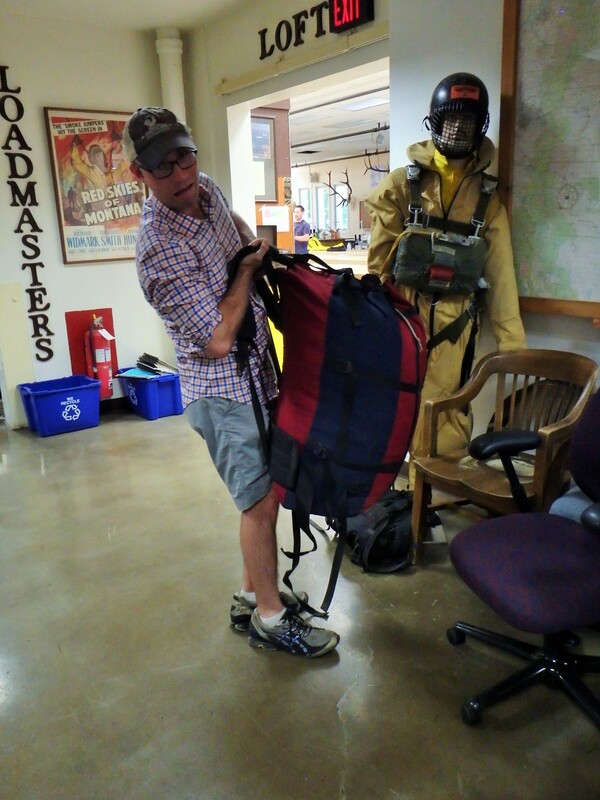 A smokejumper suppresses wildfires in remote mountainous areas. 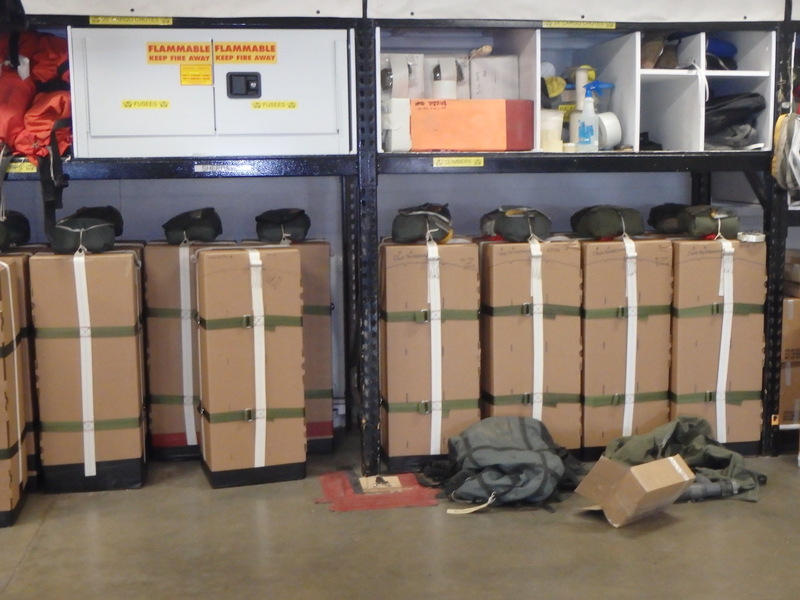 There are demanding physical requirements for the job as they parachute into remote areas and try to put out fires. 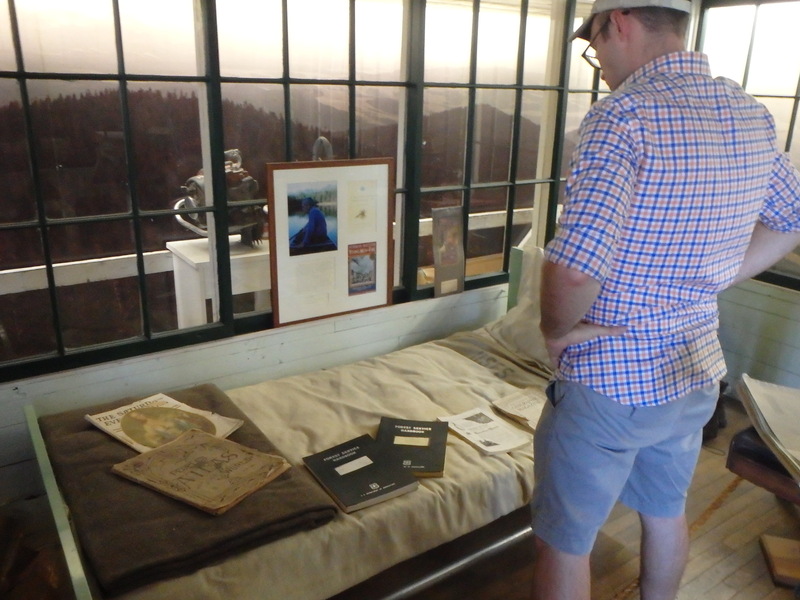 The tour was incredibly interesting; it’s a difficult job and one that I wasn’t really aware of. 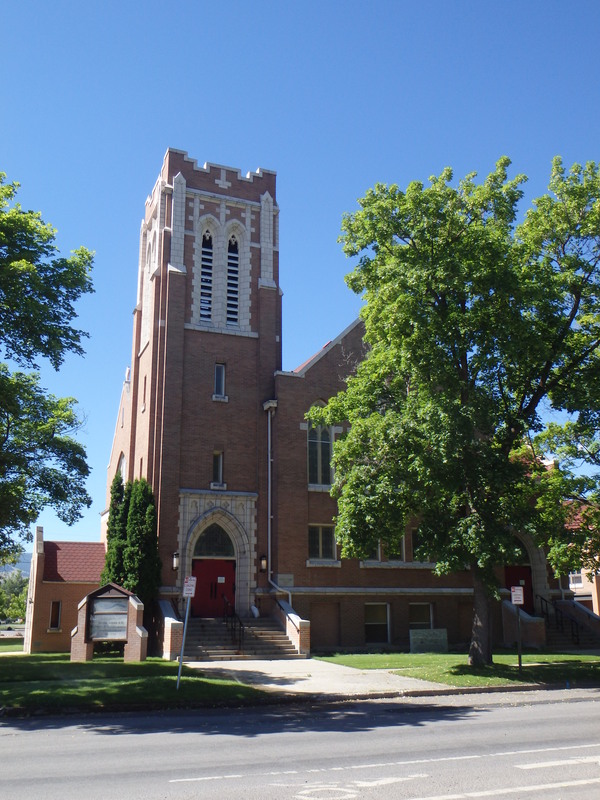 I highly recommend going on the tour if you’re in Missoula. 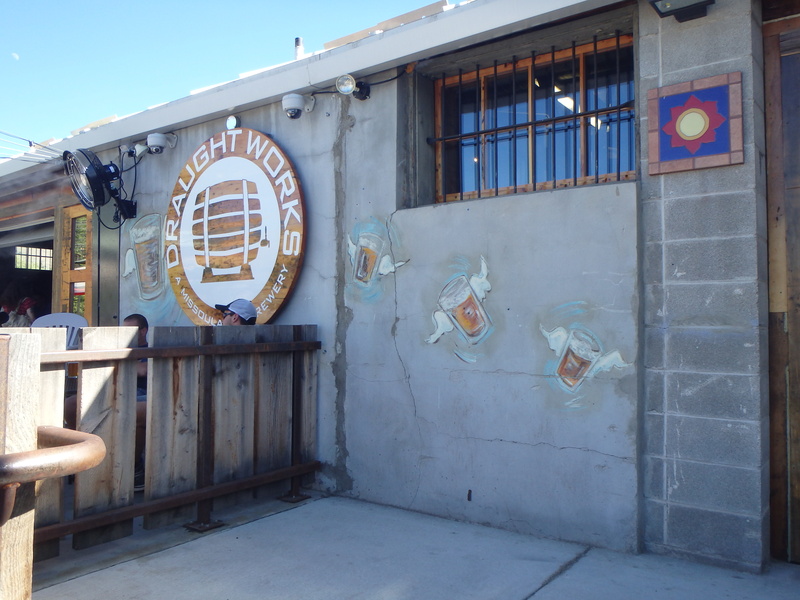 After our smokejumpers tour we mosied around Missoula, stopping at Shakespeare and Co. bookstore for a bit and then going over to Draught Works Brewery. Draught Works had a big selection of beer, complimentary chex mix, and a band so we hung out there for a while before heading back to Brian and Amanda’s. 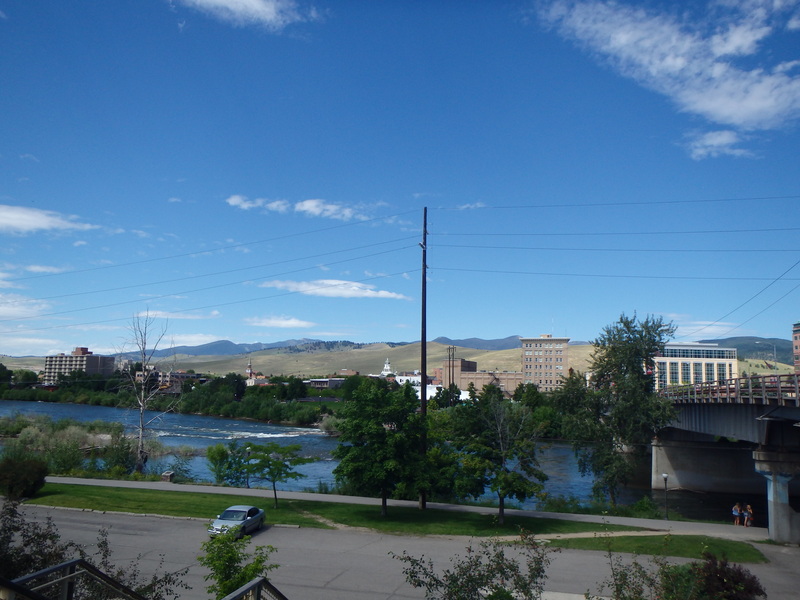 Missoula from Shakespeare & Co.
We rested a bit at Brian and Amanda’s and enjoyed the lovely view of the river from their porch. 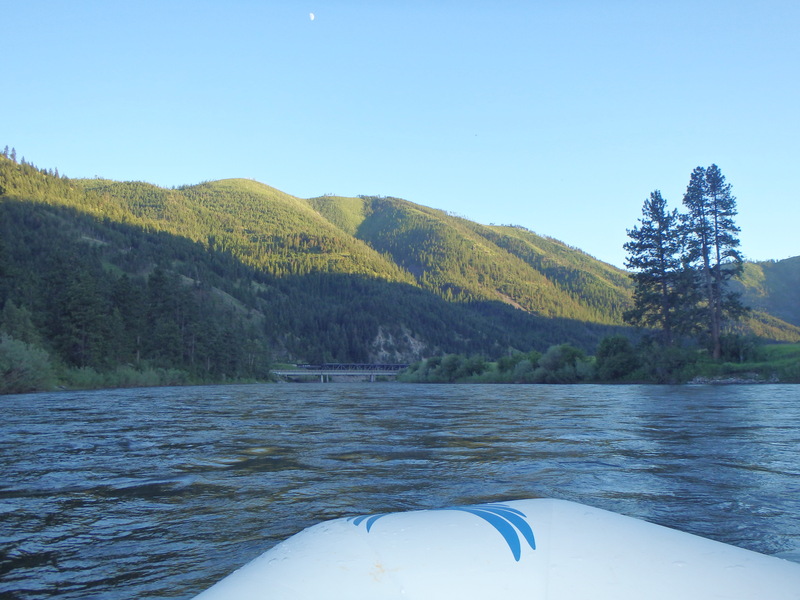 We had seen tubers going by on the river and Amanda suggested we use their raft and float down the river as the sun went down. 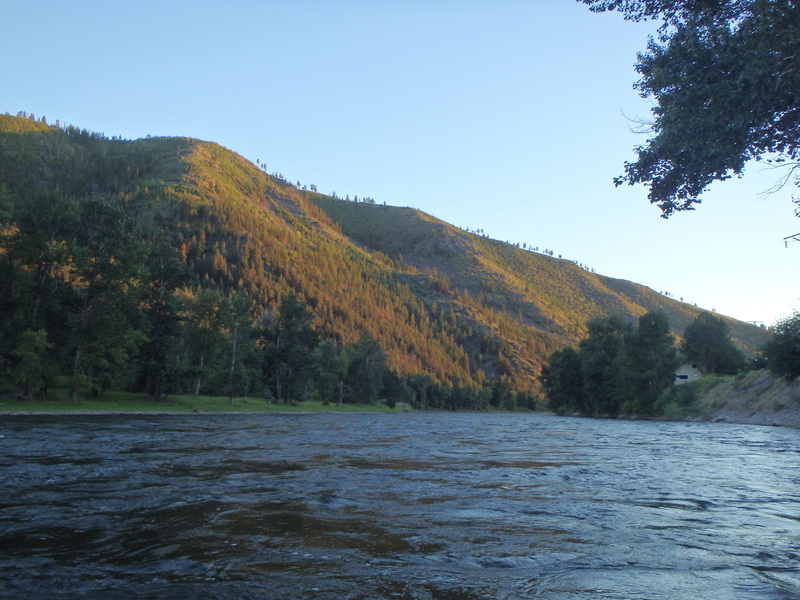 So Brian blew the raft up for us and drove us five minutes from their house so we could drop into the Clark Fork River. 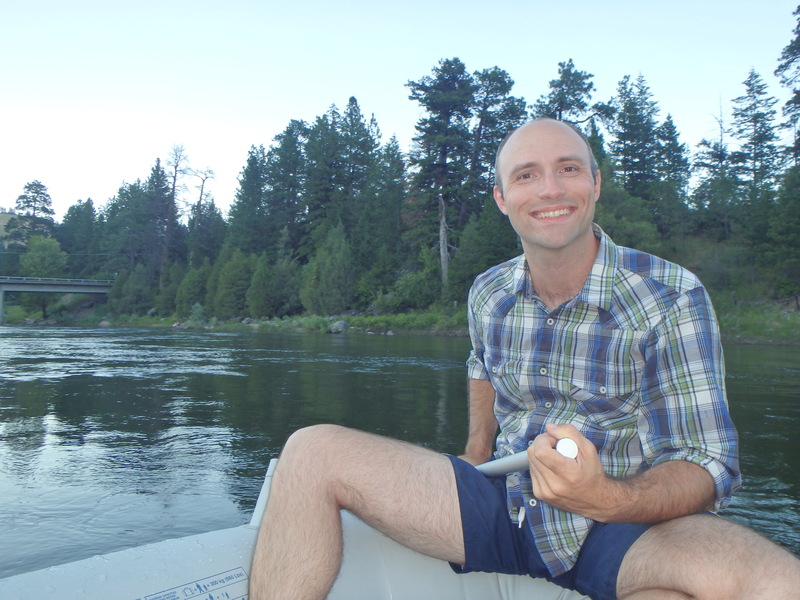 It was a very peaceful trip – I didn’t do any paddling. We drifted down the river with the current until we saw their place and then we scrambled out onto the bank and pulled the raft up the hill. It was a wonderful way to end a Sunday evening. We dried off and went out to grab a late bite to eat. Brian recommended James Bar so we went there first. Unfortunately their kitchen had just closed – which is a real shame because the interior was beautiful! So we ended up at Iron Horse Brewpub. It was nice – we sat outside on their patio – but next time we’ll make sure to get to James Bar before 10pm. 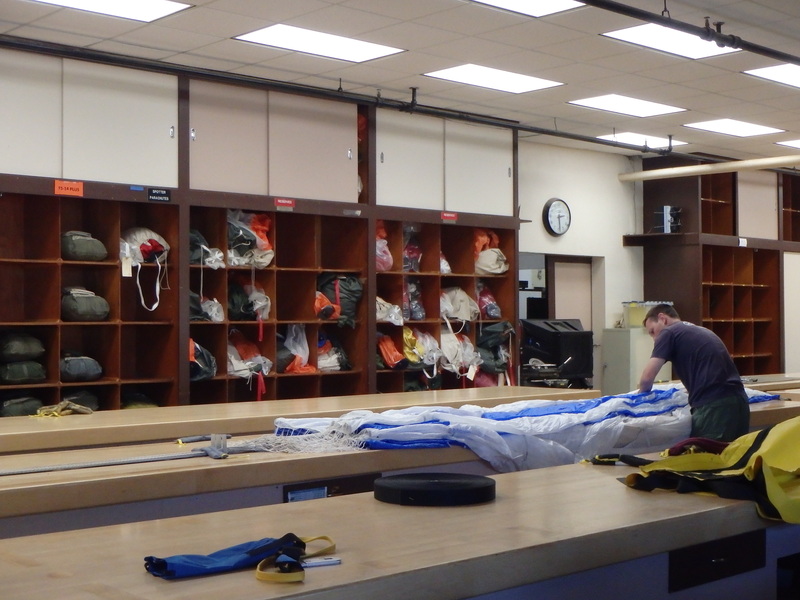 This morning we got up slightly later and got our things together. Zach read Owen a cute story (twice) and then we said goodbye. 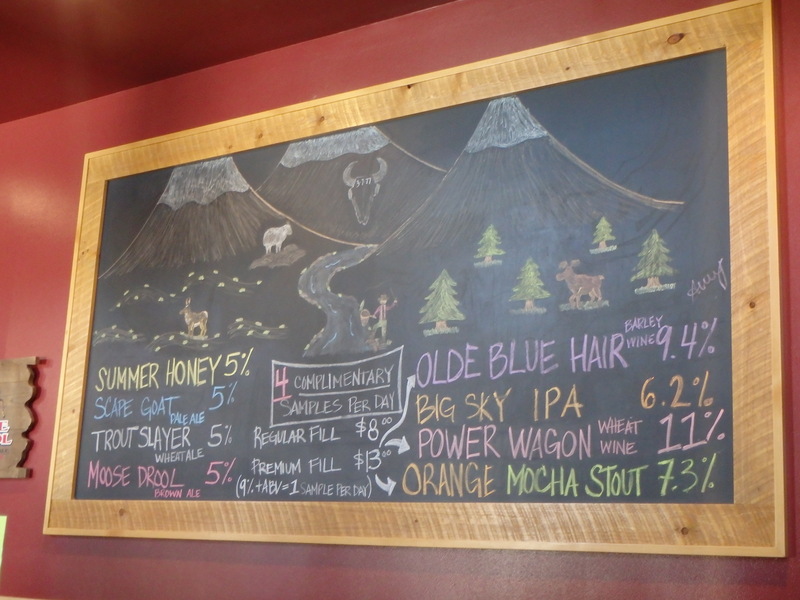 We stopped first at Liquid Planet and made my dad a custom 6-pack of Montana craft beers and then we went to Le Petit Outre for breakfast and coffee. Everything was great! I had a delicious scone and latte and Zach had a raisin pinwheel and cappuccino. 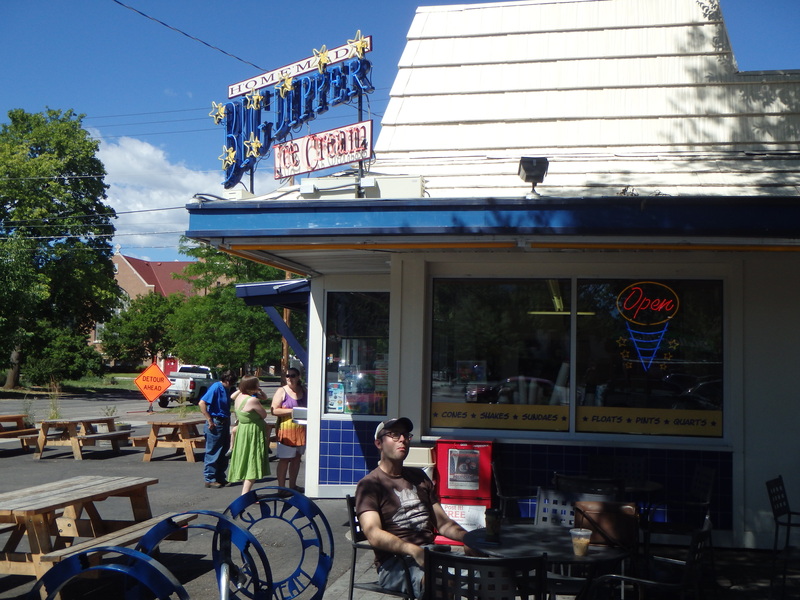 We walked down the street to the First Presbyterian where Norman Maclean’s dad was pastor and gawked a little, then went to Big Dipper for ice cream. 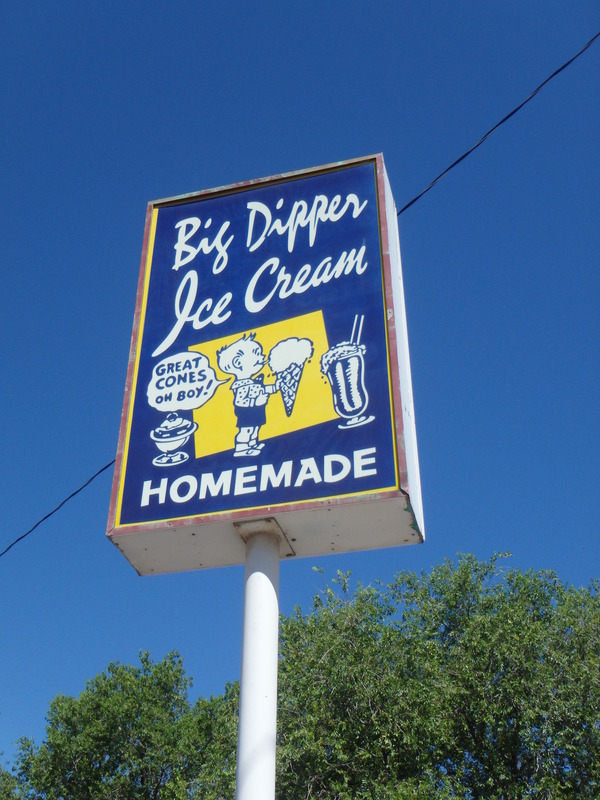 I know that sounds odd but Big Dipper is a Missoula institution and each time we drove by it there was a giant line out front. So since it was 11am there was finally no line! 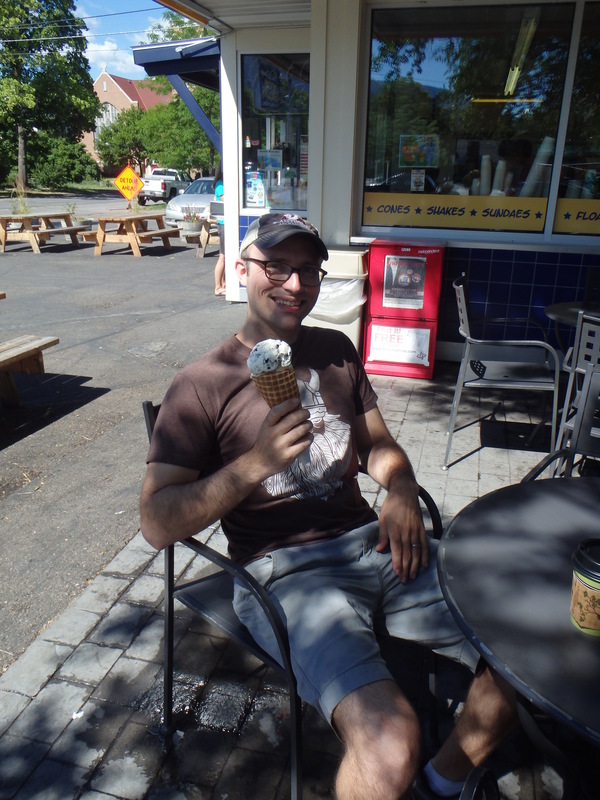 We split a cone and then walked across the street to check out a record store. Mmmm, ice cream in the morning! 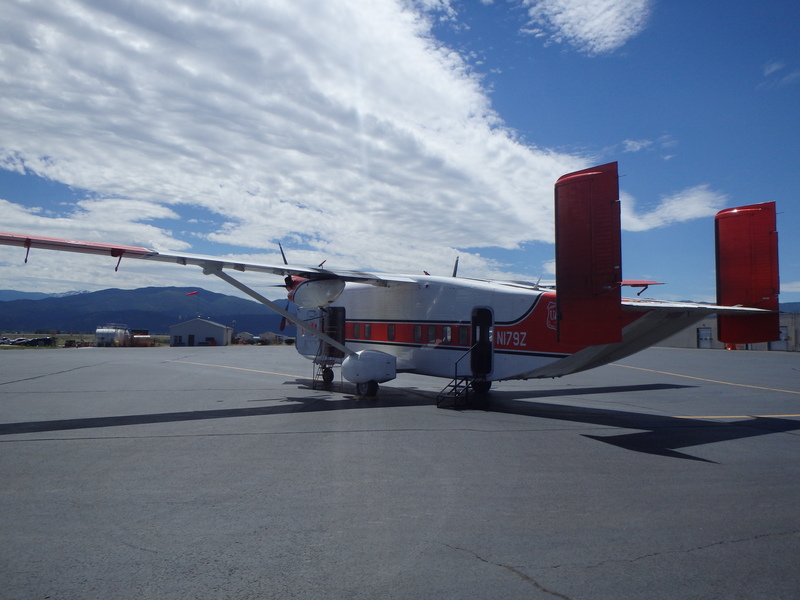 Unfortunately we had to get on the road so we left Missoula with the resolve to come back again some day.